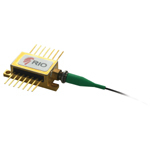 The PLANEX™ product series are high performance and industry-proven single frequency External Cavity Lasers (ECL) based on RIO’s proprietary planar technology - PLANEX™. The PLANEX laser consists of a gain chip and a planar lightwave circuit (PLC) that includes a Bragg grating. The coupling of these components forms a cavity with significant benefits, with up to 20mW output power, very low RIN, ultra low phase noise and narrow linewidth, and very low wavelength sensitivity to bias current and temperature.